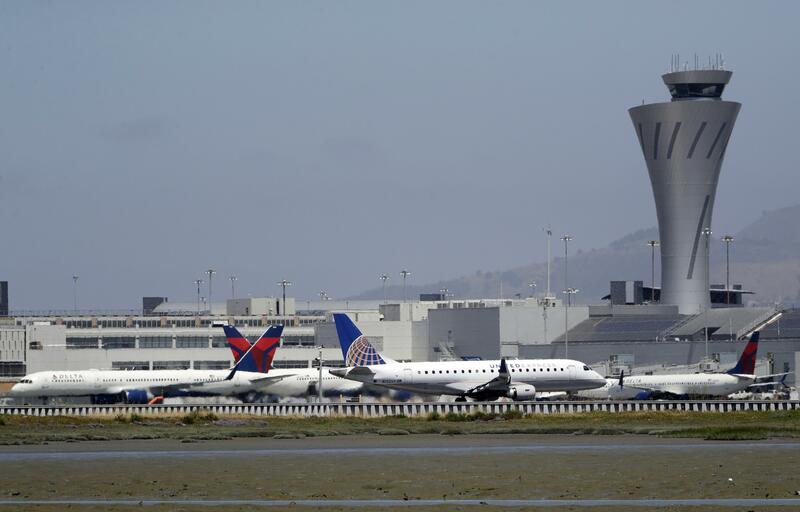 UPDATED: Thu., July 13, 2017, 6:52 p.m.
An Air Canada plane with 140 people on board came within 100 feet of crashing onto two of four planes lined up to take off at San Francisco International Airport last week, according to a preliminary report Canadian air safety regulators released Thursday. The finding provided the first official accounting of how close the Air Canada plane came to causing what could have been one of the worst disasters in commercial aviation history. Instead of lining up to land on the runway, the pilot of the flight from Toronto mistakenly descended toward a parallel taxiway just to the right of where four other airliners were idling in the darkness. Taxiways are the aviation equivalent of feeder roads that planes use to roll between runways and terminals, and have different lights than runways. Canada’s Transportation Safety Board released a short summary of the July 7 incident, which U.S. authorities are still investigating. The summary said Air Canada Flight 759 had already traveled one-quarter of a mile over the taxiway before aborting the landing. As the Airbus 320 pulled up sharply it flew 100 feet over the first two jets, 200 feet above the third and 300 feet over the fourth, the summary said. It then circled and landed safely. “This was very close to a catastrophic event,” said John Cox, a safety consultant and retired airline pilot. The U.S. National Transportation Safety Board, which is heading the investigation, has not released any information and spokesman Keith Holloway said he could not comment on another agency’s data. Transportation Safety Board of Canada spokesman Chris Krepski said he could not confirm the source of the data in the document, which was released as part of a “daily notification log” of safety incidents that Canadian air operators are obliged to report to regulators. The most likely source was Air Canada, but company spokeswoman Angela Mah would only say in an email that the airline is “investigating the circumstances and cooperating with authorities.” She said because of the investigation, she could provide no more information. Collisions on the ground are particularly dangerous because planes waiting to take off are loaded with fuel. The deadliest crash in aviation history occurred in 1977 when a KLM Boeing 747 taking off in the Canary Islands plowed into a Pan Am 747 that was waiting to take off; 583 people died in the crash and fires. There are several cases in the United States when landing planes either hit another aircraft on the ground or barely cleared one. In the instances that safety consultant Cox recalled, including several at Los Angeles International Airport, the pilots of the landing plane could not see the other airplane. In audio posted on liveatc.net, which records flight communications, the pilot said he sees “some lights on the runway,” apparently alluding to planes on the taxiway. According to the report released Thursday, the plane at that point was less than a mile from the taxiway. It would have been flying well over 100 mph. Only at that point did the controller order the Air Canada jet to pull up. Published: July 13, 2017, 5:05 p.m. Updated: July 13, 2017, 6:52 p.m.